Welcome to our “Autumn” newsletter. AUTUMN EVENT: our next meeting for Supporters and friends is on Tuesday October 18th in St Pancras Church Hall at 2.30pm. This is the venue we used for our meeting last Autumn, a short walk or drive along St Pancras with easy parking next to the Newell Centre. It will be another sit-down meeting, with an illustrated talk by James Kenny, our District Archaeologist, on recent archaeological work around – Chichester, entitled “Geophysics, LIDAR and new discoveries”. It should be a most interesting and topical talk, and he will welcome your questions and comments. Additionally there will be brief updates on the work of the Trust, and on the achievements and plans of the European Walled Towns network with which the City and the Trust are actively associated. Then please enjoy a chat over tea. Do please bring friends, and, if possible, let our Hon. Secretary Doris Norton (539752) know numbers ahead, for catering purposes. SPRING EVENT: On a sunny day in late May, a small number of us ventured across to Portchester Castle, the best preserved, of the Roman forts built in the 3rd century AD to defend the “Saxon shore” with walls and bastions still standing to their full height. It later became a Saxon settlement, a Norman castle, a medieval palace, a civil war barracks, a 19th century prison camp, and a 20th century defence establishment. We explored the outer walls admiring and measuring the bastions; we visited the Norman church and a few of us scaled the steep stairways of the Norman castle to take in the long views of harbour, coast and hills. We also learned much from the exhibition, both about the castle’s amazing history and survival and about the extensive archaeological work in and around the castle over the years. Then we adjourned to the nearby “Cormorant” pub for a review of our visit and a good lunch. 2016 WALLS WALKS: We have continued to offer and advertise our free guided tours of the city walls on the first Sunday afternoon of each month, starting from the Cathedral Bell Tower at 2pm and lasting about 90 minutes. These will continue throughout 2016 on October 2nd, November 6th, December 4th, and on equivalent dates into 2017. We also offered walks during the Chichester Festival on the other Sunday afternoons, ie June 19th and 26th, and July 10th and 17th (as well as 3rd). The walks overall continue to be quite well supported, and our enthusiastic guides raise interest, sell booklets, and recruit to the cause. 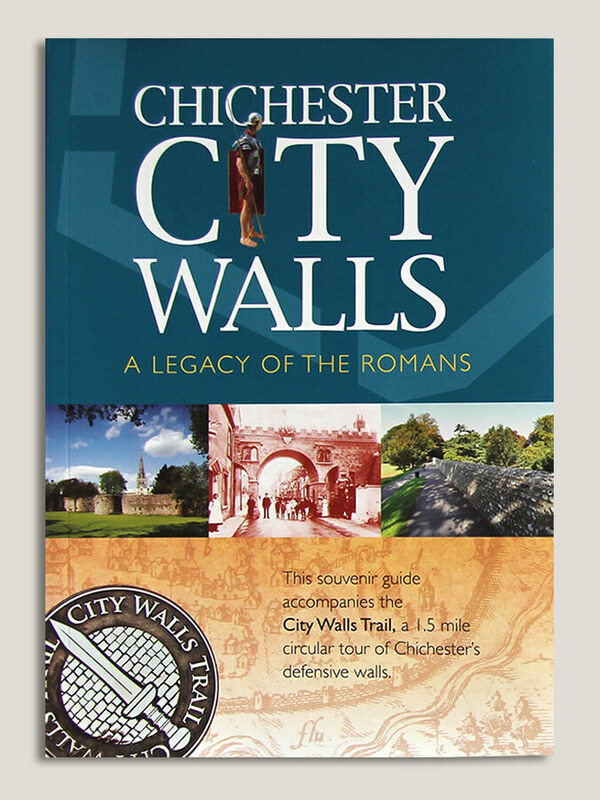 Our Walls book and booklet are also popular at the Novium TIC, Cathedral shop, Fishbourne, and other outlets. So far we have not charged for most walks, merely encouraged donations, but we feel we will need to insist on a small “minimum donation” at least for adults, from next year, to ensure the Trust benefits directly from these walks. 2017 EVENT: Next May we plan another Chichester walk, to explore with an expert the different types of local stone visible in the city’s older walls, their sources and their histories. Details in the Spring Newsletter. OUR WEBSITE: is “live” and we are negotiating some small improvements with Profile Design based on user experience. Please go to www.chichesterwalls.org and explore for yourself. We hope you will find it attractive and full of interest, and it will attract wider interest in our historic city and walls, for research and visits. Our Hon Sec has reported one new Supporter through the website and we hope for many more. AROUND THE WALLS: Last Newsletter we noted interesting archaeological work outside the city, and we look forward to James Kenny giving more details at our October meeting. The recent aerial survey, using “LIDAR”, of the area north and east of Chichester detected traces of previously-unrecorded pre-and post-Roman settlements and field systems, and further evidence of the Roman Roads in the area. New geophysical equipment, Ground Penetrating Radar (GPR) has been used to look at selected sites around our city, and has so far examined Roman remains around the Cathedral, the Amphitheatre, and in Priory Park, and we hope other accessible parts of the city surrounds, eg around the rest of the walls, can be surveyed with this equipment later. Further afield GPR has been a boon to the excavations of the Warblington Villa site west of Emsworth. Excavations are continuing this month. What is already clear is that this is a bigger and much longer-occupied farming site than originally suspected. Bronze and Iron Age buildings and artefacts are appearing, as well as the Roman ones. NOVIUM MUSEUM: We hope Supporters have been able to visit the extended Roman Gallery on the ground floor of the museum, which tells the story of Roman Chichester much more comprehensively, and has additional exhibits. There is also a useful new booklet, written by James Kenny, guiding people around the not-so obvious Roman sites within the city. It neatly complements our own Walls Guide. ANNUAL SUBSCRIPTIONS: A regular reminder from our Hon Secretary that 2016/17 subscriptions were due April 1st, and the rates are unchanged at £5/£7. * = new. Welcome to Catherine and thanks to all for help and support.